Keisha Smith Jeremie is the founder and CEO of sanaia, a coveted applesauce brand. Capitalizing on trends such as the plant-based movement and the reimagination of childhood treats for adults, the sanaia brand has the makings of a household name. Keisha was the first to recognize that there were millions of applesauce-loving adults who were being completely ignored by the sector, and so she developed sanaia specifically with those adult taste buds and consumption habits in mind. Currently a $900 Million market with 99% of the spend focused on children, Keisha believes that applesauce is ready for the kind of disruption that grew yogurt from an 8BN category to the 125BN category that it is today – and that sanaia is the brand that will lead the way. Growing up in the Bahamas, fruits have long been a savored indulgence of Keisha’s. Her favorite childhood pastime was climbing the fruit trees in her backyard, stuffing her little pockets with the sun – sweetened treasures of each season. She developed sanaia with the goal of creating a snack that proves what she has long known to be true —fruits are nature’s most delectable desserts. She was inspired to infuse applesauce with fruits from her childhood such as guava, tamarind and hibiscus and with that sanaia was borne — a naturally indulgent snack that transports you to your very own paradise. sanaia launched in 2017 at the acclaimed James Beard House Iconoclast Dinner, and is currently produced in Harlem at Hot Bread Kitchen a renowned startup incubator for specialty foods in New York. Keisha is the Chief Human Resources Officer at a global Fortune 500 company. With over 20 years of experience enabling organizations to excel, she is perfectly positioned to take sanaia on this fruitful journey. 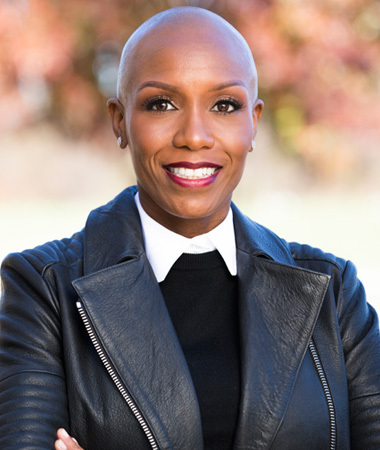 She also serves as a Director on the Board of the Eagle Academy Foundation, a collection of public schools in New York and New Jersey focused on changing the life outcomes for young men of color. She and her husband reside in New York where there are snow days a plenty, and while there’s no place quite like home, sanaia applesauce is the next best thing.